Home / Blog / Flea dog collar vs. flea drops? Dog flea treatments. Flea dog collar vs. flea drops? Dog flea treatments. When dogs get fleas, it can be a nightmare for both dog and owner. There are so many different types of flea prevention and flea treatments for dogs. It can be hard to know where to start. Flea dog collars have been around a long time, and pipetting flea and tick drops onto your dog has become standard practice. Understanding which is best and when to use could save a lot of pain and irritation for you and your dog. How to spot fleas on your dog? If you see any of the signs above, then grooming your dog is a good way of checking. When using a comb, you may see lots of black specs coming off your dog’s coat. These are not necessarily fleas but likely to be flea droppings. Add water to the specs and if it turns brown then its probably mud. 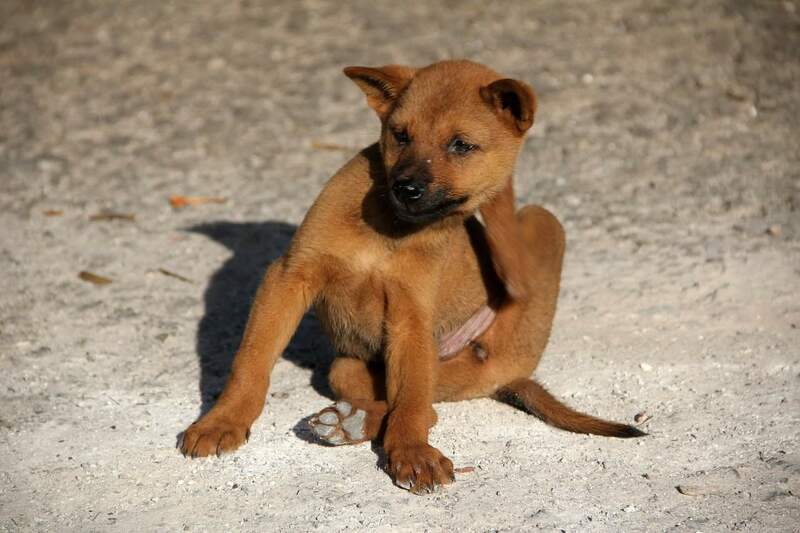 However if it turns a reddish colour then it is very likely to be fleas, you should look to treat. If you are unsure either way, then you should speak to your vet. What are the different flea treatments? Dog flea collars are very simple to use, simply attach and possibly trim to size and you are done. Good dog flea collars are effective and can last for quite a few months. If you are against using chemical drops or anything topical then they are a good option. Remember they are not normal dog collars and so don’t attach a lead to them. These are very easy to use and usually applied monthly. A few drops around the neck and towards the tail and you are done. Very easy to use and can give good coverage against fleas and ticks. We have personal experience of this kind of treatment using on a monthly basis. During Oscar and Hooch’s long and very full lives (15 years) they were lucky to never suffer with fleas. The only con with spot on treatments is your dog cannot get wet 24-48hrs after application depending what you use. Flea shampoos are effective when your dog has fleas and will help reduce the irritation by killing the adult fleas. To prevent further fleas, you are going to need to use something else such as a dog flea collar or spot on treatment. Bear in mind your dog’s bedding will also need washing! Oral dog flea treatments ,like spot on treatments, can help prevent fleas and some will kill existing fleas. If your dog likes to take tablets then this could be a good route. A good dog flea spray will act like a good flea shampoo and kill the adult fleas. It should be used in conjunction with one of the other dog flea treatment types. This will ensure further prevention and reduction in flea larvae. Considerations of dog flea treatments? Route of administration and likely success with your dog. If they don’t like collars then spot on will make more sense. Most dog flea treatments use chemicals so you need to be careful. You should know your dog’s weight as most treatments vary by weight of dog. Dog flea treatments can be poisonous and even fatal for cats so never use on cats. Check age restrictions on your dog flea treatment as you will need the right one for a puppy. Lastly don’t get too carried away, follow the package instructions or your vet’s advice. Giving extra treatment doesn’t mean you will get rid of the fleas any quicker and does pose the risk of overdosing in your dog. Before you even consider dog flea treatments, you should get yourself into a good grooming routine with your dog. A regular groom (whether by you or a professional) will help identify fleas early on and may prevent a major infestation.